An outstanding application will help you on your way to camp! 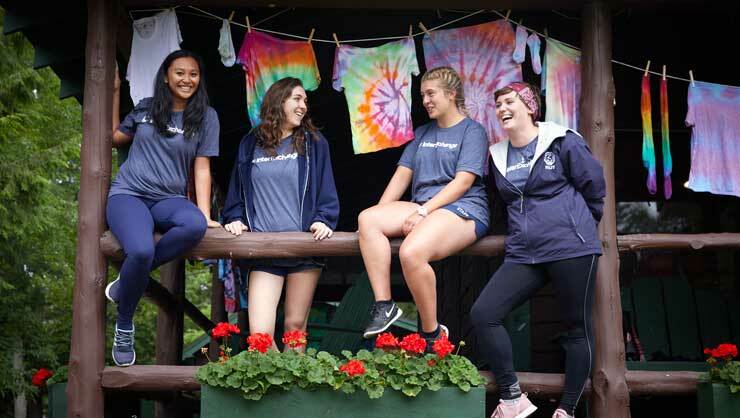 An outstanding application shows camp directors your motivation for working with kids, highlights the activities, sports, and hobbies you're passionate about, and explains why you would love to be a counselor at camp! It is well-written, proofread, and brings up examples of skills and experiences you could bring to a U.S. summer camp. Camp directors are looking to fill their open positions with great candidates. The skills section helps create an idea of the types of activities you could help teach at camp, and what role would be the best match for your personality! A strong skills section includes details! For example, if you choose swimming as a skill, include the styles of swimming you are most familiar practicing. An applicant who says he or she is skilled at butterfly stroke, freestyle, and backstroke gives a much clearer picture of his or her abilities. If you list arts and crafts as a skill, what kind of arts and crafts do you do? Elaborate! It's a great idea to mention how much you've enjoyed your latest stained glass project, or that you love sketching and creating pen drawings, portraits, etc. You could even upload some examples of your drawings to your documents section! Do I need a specific skill to apply? What if I don't have any specific skills? If you love working with kids and enjoy the outdoors, then this job is for you! Previous childcare experience is always a plus, but you can still apply without it. There are so many skills you can offer to a summer camp! A great attitude and a desire to work with campers are the main attributes camp directors want to see in an applicant. Nearly every applicant uploads a video, so create one! Your video makes it easy for camp directors to quickly get a sense of your personality and motivation to work at camp. Your application video is meant to show who you are, so relax, be yourself, and get creative! Remember, your video does not have to meet any certain requirements. It can be as short as 30-60 seconds, or as long as you'd like. You can even include a slideshow of photos that shows your participation in sports, examples of your art, clips of performances, etc. Have fun with it! Think of the personal statement as a short, informal cover letter. Explain what is motivating you to spend a summer in the U.S. and what you will bring to camp! To apply, InterExchange requires a medical report completed by a doctor within the last year, and a police check conducted within the last year. You will also need to upload a copy of your passport, and two reference letters. If your police check, medical report, or passport application is in progress, you may select "no" when asked if you have the document. The application will then prompt you to estimate when you expect to have it. You will need to ask for two recommendation letters from two different people to apply! You will need to ask a former employer or teacher to write a letter that explains why you would be great for this position! This letter should give insight into your personality, and examples of your strengths and skills. This letter is meant to highlight one of the three skills you plan to list in the skills section of your application. For example, soccer, lifeguarding, acting, etc. Request this letter from a former coach or individual who can speak to your talents. The earlier you submit your application the sooner we can get it in front of camp directors! We match many applicants in the fall, so submit your application as soon as you can to know your summer plans ahead of time! The deadline to submit your completed application with all required documents uploaded is March 1st. If you are applying through an international cooperator, keep in mind that you may need to interview before March 1st in order to meet submission requirements. Congratulations on taking your first steps towards an unforgettable summer at camp. Camp is just around the corner!